The B has a speaker in each door card, but the sound has always been a bit scratchy, so it seemed a good idea to pull them apart and clean the connections. I'm not sure if these were factory fitted or not, but dealer or factory they made a good job with clean cuts in the door card. 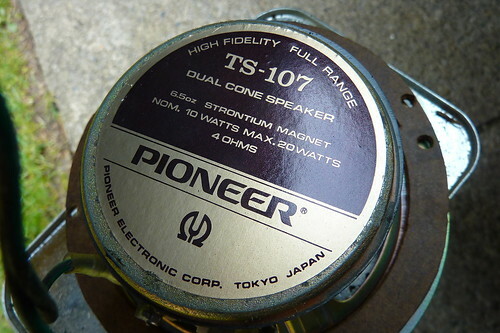 The speakers themselves are Pioneer TS-107s which date them to between 1979 and 1985 and they still put out a good measure of sound in the small cabin. After removing the speakers it was clear that the junction connection which mated the wires from the radio to the wires from the speaker had rusted up totally. This meant that instead of just adjusting the wires I had to re-strip them and replace the junction too, but it now means the speakers are crackle-free. One good thing about removing the speakers was that it gave me the opportunity to have a look inside the door itself. Good to see that the inner surfaces had all been waxoiled and that the drain holes were clear. It is also a good entry point for redoing the waxoil in the future.